HALLIE EPHRON: When I finished reading Julia Dahl's Edgar-nominated first novel, Invisible City, I dearly hoped that the story wasn't over. Because though the main mystery was solved, a bigger (to me) mystery -- why Rebekah's mother had abandoned her and where she was now -- remained to be answered. 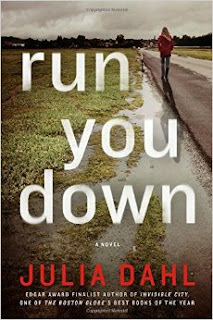 So I'm delighted that Julia's second novel, Run You Down, is a sequel. And I'm thrilled to host Julia herself to tell you all about it. JULIA DAHL: The idea for my first novel, “Invisible City,” was simple: I had been told by activists and police officers that in cases of sexual abuse and domestic violence, people in the insular Hasidic Jewish neighborhoods of Brooklyn, N.Y. were often reluctant to talk to authorities about what they had witnessed for fear of bringing scrutiny onto their community. But what would happen, I wondered, if there was a murder in this tight-knit world? Would people speak out then? Over the next six years, I explored that question. HALLIE: I was riveted by all the details Hasidic famlies, neighborhoods, their relationships with the police and religious authority. How did you find all that out, given how secretive the community can be? JULIA: I met people who had grown up Hasidic, and some who still lived the strict religious life. I sought to tell their stories through the eyes of my narrator, Rebekah Roberts, a young reporter trying to make a name for herself at a seedy New York City tabloid. 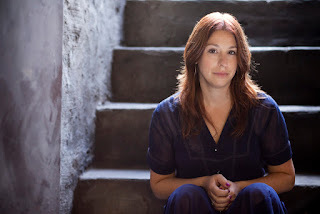 To connect Rebekah to the world of the Hasidim, I created the character of her mother, Aviva Kagan, who ran away from the cloistered world of Borough Park as a teenager, got pregnant, and then abandoned Rebekah and her father. When, at the very beginning of “Invisible City,” Rebekah is assigned to report about the murder of a Hasidic woman, she uses the opportunity to learn more about her mother’s world – which is she both disdainful of and fascinated by. HALLIE: Rebekah's personal story is just as compelling as the murder she's investigating. But left those answers hanging. JULIA: As I got to the end of the tale of the murdered woman, I knew that there was a missing piece to Rebekah’s story: her mother. Why did she leave Brooklyn? Why did she abandon her child? And where has she been for the past 23 years? But introducing Aviva would have taken “Invisible City” in an entirely different direction. It was, I realized, another story. Another book. HALLIE: Did you know there'd be a sequel? JULIA: I hadn’t initially conceived of “Invisible City” as being the beginning of a series, but when Minotaur gave me the opportunity to write a sequel, I jumped at it. Immediately, I knew that “Run You Down,” would be different from “Invisible City.” I wanted part of the book to be told by Aviva, and I wanted to examine different issues. I also had a deadline, which was something I hadn’t had with the first book, which I wrote in my spare time, unsure if it would ever get published. HALLIE: Ah, a deadline. How did that work out for you? JULIA: I wrote the first draft of “Run You Down” in about 10 months, then spent six months doing revisions. Alternating narrators was a challenge – I had to make sure the voices were distinct, that present and past action flowed smoothly, and that the reader wasn’t “ahead” of Rebekah in her investigation into the death of Pessie Goldin. Writing “Run You Down” was by far the hardest work I have ever done. For whatever reason, the plot of “Invisible City” came relatively easily to me. “Run You Down” – perhaps because there were more moving parts – was a puzzle. There was a lot of frustration (I have nearly 300 pages of deleted scenes), but each time I hit what I thought of as a “plot knot,” I knew that if I just gave myself a little time, I’d unravel it. I started to think of the finished book as a Rodin sculpture. I had a block of marble and for nearly two years I chipped away, knowing that as long as I kept chipping, eventually, the rough stuff would fall away and the object inside would appear. HALLIE: Your process sounds as chaotic as mine. My "OUT" file is usually almost as long as the novel. Did it make it any easier knowing who Rebekah is? JULIA: As I was writing, a lot of people remarked that writing a sequel “must be easier” because I “know the characters.” In some ways this is true, of course: I know Rebekah’s backstory (though I was fuzzy about Aviva’s), but Rebekah was not the same person I began writing about so many years ago. When “Invisible City” began, she was in many ways unserious and immature. By the last page, she had evolved into a more professional reporter and a more empathic, if still judgmental, human being. In “Run You Down,” which begins just a few months after the end of “Invisible City,” I knew these new parts of her would be tested. Could she balance the demands of reporting for a tabloid with her growing instinct that she is, as she puts it, “a human being before a reporter”? What choices would she have to make? Who would she have to disappoint? I knew that if I was going to keep readers interested in Rebekah (heck, if I was going to stay interested in her) I had to answer these questions. I spent a lot of time gazing at walls, trying to slip into her skin and feel what she would feel. We’ve become close, Rebekah and I. And now, as I write her third story, I am happy to say that if we met in the newsroom, I think we might be friends. HALLIE: And I'll be lined up to read it. Thinking about this, I'm wondering do series protagonists need to change? Do series protagonists need to change? Probably so; life isn't stagnant, so I would think they should change by virtue of what they experience. I'm looking forward to reading the next chapter in Rebekah's story . . . .
Brooklyn is in the house! Julia, so loved your debut novel and can't wait to read this.... Do protagonists need to change? Mine has, for sure! Interesting... Sometimes there is a real change, forged by experience. But sometimes the character is really becoming truer to themselves. (Or maybe both? Is that possible?) I don't write series, but in my standalones that's usually what happens. A character discovers what really matters. DO protagonists need to change? Huh. They learn things certainly, and re-assess. And in a series, they can;t figure out what really matters in book after book--I think that's the challenge. Because if they do, how un-formed were they to begin with? So, in a series, like life, it's an evolution. We have our core values, and they are tested. Some change, some get more resilient. Cannot wait to read Run You Down! I'm so excited to read your new book. I think Hallie did a great job exploring all the reasons I love your series so much. It was great to see inside your writing world and process.. I find that a series character does need to change, which isn't always easy to show because it is important that the writer maintain what people first loved about the character and yet, still show growth. Good point, Kristi - that change thing is a bit of a tightrope walk. Welcome Julia--so interesting to hear about the difference between writing a first book and the sequel. I love Hallie's comment about a character becoming truer to herself as the book evolves. Going to put these books on the tbr pile! As for Run To You, I can't wait to find out more about Aviva. She was such a strong presence in the first book, even without being there. I just know that she is going to be just as compelling as Rebekah. I think Kristi and Hank both hit on parts of the complexity of this issue for me. Readers come back because they like the characters, but a series can stagnate for me if it's just a different murder, same old story. I like it when my knowledge of the character evolves--their core values don't change, but they find themselves reacting to new people, new circumstances--or issues and people from their past crop up and intersect the present, foreshadow the future. Julia's Rebekah is a perfect example of this. Julia, I love your comment about plot knots - how true. Pick and them and eventually they'll unravel. Delving into a community like the Hasidics must have been fascinating. Do series protagonists have to change? I'm kind of with Hank. They need to learn things - things that either strengthen their values or they change. But yes, the core that attracted people to them has to maintain some level of constancy (and as Hank said, they can't always be figuring out what really matters - although that belief can be tested in many ways). Hi everybody! Thanks for the support and for your thoughtful comments! WHAT A THRILL to be invited to contribute to Jungle Red . Keeping Rebekah both true to the kind of person she was (and who readers really seemed to connect with) AND evolving, as we humans do, was definitely a challenge, but I had a lot of fun with it. And like I said, I think I like her better now that she's a little more mature; still a chip on her shoulder, of course, but that's now tempered by some real life experience with people very different from her who she is forced to contend with and not just dismiss as "weird." Thank you all again for chiming in! Perhaps the most wonderful thing about publishing a mystery novel has been the almost unfathomable generosity of the community of fellow writers and readers. I'm a lucky lucky girl! Julia we're thrilled with YOUR success! I was late to the Julia Dahl party - which won't surprise anyone who knows me! I picked up INVISIBLE CITY when it was nominated for the Edgars and was quite blown away. Thanks for the glimpse into the torturous process of writing the SECOND book. It does seem as if it would be easier, but I don't know a single author who found it so. I wonder if you had the same experience I did, Julia: having a debut that got a lot of attention and awards, I was in despair while writing the second, because I had no idea what I had done right the first time. I thought my first success was some sort of unreproducible freak of publishing, and that my second book would fall flatter than a pancake and I'd have to go back to being a lawyer. Needless to say, the second book came out fine, but I'll never forget the sense of looking over my own shoulder as I wrote, wondering, "Is this is? Is this how to do it?" Julia D, I am behind, as always (and like Julia:-)) but I am so looking forward to reading BOTH books! I'm fascinated by the Hasidic community, and it sounds like you've got a great character and great storytelling. Very interesting about the character evolution, as I'm doing what I've now dubbed "The Great Reread Project", going back to the beginning of the series and reading in order. I will be thinking about how my characters have changed. I'd actually finished most of the revisions to Run You Down when Invisible City got nominated for an Edgar, which was, perhaps a blessing - especially because RYD is quite different from IC. Maybe I wouldn't have had the guts to change things up if I'd been trying to re-create what worked in IC! I hear you, Julia, about not knowing what I did "right" with IC. My husband and I have actually had long conversations about this - trying to pinpoint what readers liked, and how I can keep that as the foundation, while expanding the scope and characters. It's definitely something I'm thinking about more as I write the third book! Julia, Rebekah's story and its involvement with Hasidic Jews sounds fascinating. Ever since my trip to Niagara Falls two years ago, where my traveling buddy and I stayed at the same hotel as a large group of Hasidics traveling together, I have been interested in their way of life, their closeness that envelops them and shields them from others. What I thought at first was rude behavior was, I think, these people's normal avoidance of interaction with non-members in a closed society. I can't wait to get my hands on Invisible City and read a mystery with focus on this group. I already feel as if Rebekah is going to become a favorite character. Your description of writing the second novel and its challenges is most interesting. I'm betting that most people, including me, don't realize that #2 is that hard. Our own Julia here gives some great insight on that, too. There must be tremendous pressure to not disappoint those who love the debut. I plan on reading both books for sure. Oh, and I liked what you said about the 300 pages of discarded text, not that I'm happy you had to go through that. There was one very popular book in the last couple of years that would have benefited from truncating its excess. Hallie, thanks for bringing Julia to my attention and giving us a great interview. I'm so excited about starting this series. Hi Julia, what a fascinating series. In response to that question of characters changing, I like it when a series character evolves. As Joan said in that very first comment, life isn't stagnant, so I like it when the character grows. Hello Julia, I haven't read INVISIBLE CITY yet, but I'd been planning to -- now I'm even more intrigued. Your comments about writing without a deadline versus with a deadline interest me. My second novel will be coming out next year. I spent years on the first one, and I had plenty of time for the second one too (all that waiting to get the first one going! ), but now I need to start the third one and have it done in a year. I'm a little nervous, which is making it harder to get started! I write a series too -- I think series protagonists need to change. Poirot and Marple are great, but I wonder if they'd fly if Dame Agatha were writing today. 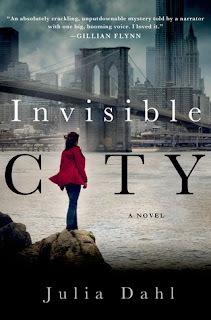 I have somehow missed INVISIBLE CITY, but it sounds great and I will now put BOTH books on my TBR list. I really love series, and I would have to say that I think the protagonist does have to grow and change to remain believable and interesting. Some of my very favorite authors do that beautifully, like Deborah, and Margaret Maron, and Laura Lippman. But I can think of other examples, who I will charitably not mention by name, where either the protagonist has stayed too stagnant and therefore become almost a caricature of him/her self, or has changed so much as to become unrecognizable as the character I fell in love with. (And strangely enough, it seems like when the latter happens, it tends to happen in a sudden shift.) So I can see that it is a very challenging thing to accomplish. Wonderful series. I missed Invisible City. The story really resonates for me. Many years ago I lived in NY and worked with a Hasidic woman, the first I had ever met, she wanted to be more secular and her husband was very traditional. She often talked about the push you/pull me type of thing you describe. I don't think protagonists have to change, but I do believe they need to grow and evolve over time. Margaret Maron's Deborah comes to mind immediately, so does Allison Brennan's Lucy Kincaid. I wrote a long post this afternoon and it's not here. I'll have to rethink what I wrote. Great to meet you, Julia D. Your books sound fascinating and they're now on my wishlist. Intrigued and have just requested both books! I remember Howard Schwartz telling us in a writing class at UMSL that one part of Delmar in University City was a neighborhood popular with the very traditional because it was walking distance to the synagog. Balancing modern life with the traditional, a fascinating challenge.